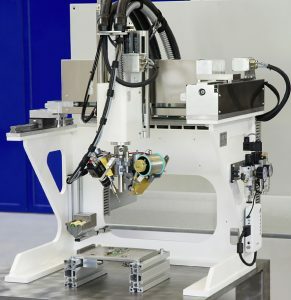 For applications, which do not necessitate the flexibility of a robot, the simple soldering station satisfies all required needs. The modularity of our slides and standard elements mean that there is always a solution adapted to the application. The programmable electronic control allows the soldering axes and values to be set. Adapted for 1 or 2 point automatic soldering. Microprocessor control for setting the soldering axes and values.